Is this the only statue of Lincoln on a horse? The massive Soldiers and Sailors Memorial Arch at Grand Army Plaza, commemorating Civil War valor, is Brooklyn’s Arc de Triomphe. Inside the arch, dedicated in 1892, is a curious relief of President Lincoln. He’s on horseback—an odd pose for a leader generally depicted sitting or standing (as he’s shown in Prospect Park and Union Square). The horseback depiction is so unusual, it’s said to be the only one in existence. Consider it another work of art truly unique to the former city of Brooklyn. Those are some menacing-looking Brooklyn snakes, aren’t they? They form the handles of a series of Grecian urns that greet passersby and park-goers at the Grand Army Plaza entrance to Prospect Park. 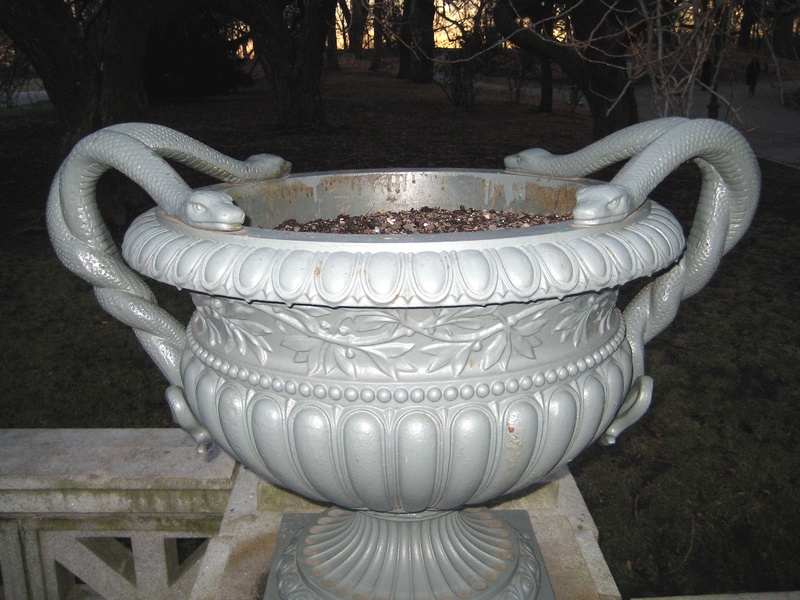 Fourteen urns just like this—that’s 56 snakes total—top a low wall. The bronze originals were placed there by Stanford White, part of the design team brought in to redo the park’s entrance in the 1890s. Over the years, many of the urns disappeared—well, were stolen is more like it. These cast-iron replicas replaced them. Subway station art can be easy to miss when you’re anxiously pacing the platform wondering where the hell your late train is. But a lot of it is truly lovely—like this terra cotta mosaic depicting two trumpeting angels flanking an early 1900s train. It greets 2 and 3 train passengers at the Grand Army Plaza subway station. Created by Jane Greengold in 1995, the mosaic is meant to evoke the triumphant angels on top of the Soldiers and Sailors Memorial Arch right outside the station. 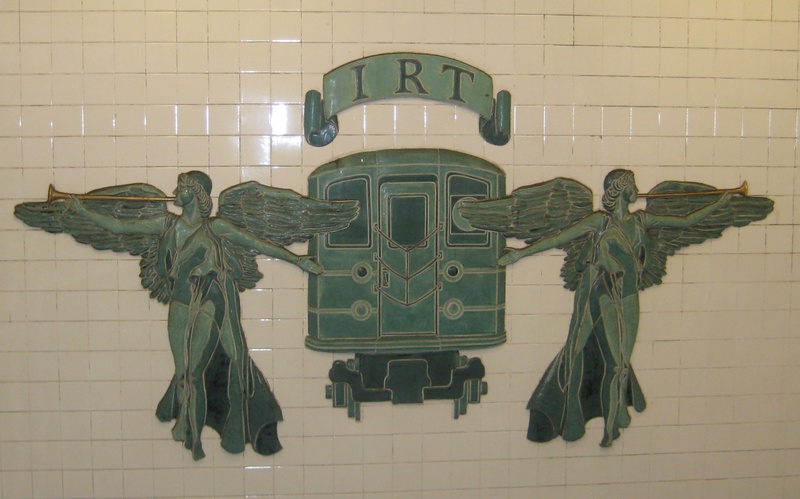 It’s also an homage to the old IRT logo, which featured a subway train with angel wings. Check out these close-up images of the sculptures gracing Grand Army Plaza here. Fifth Avenue at 59th Street has been a prime piece of real estate since the late 19th century. The first luxe development there was the Hotel Savoy, built in 1892. It was actually an apartment house with a host of wealthy tenants. It also seemed to be a fairly popular place to commit suicide. The New York Times archive includes several accounts of well-to-do men who offed themselves there. 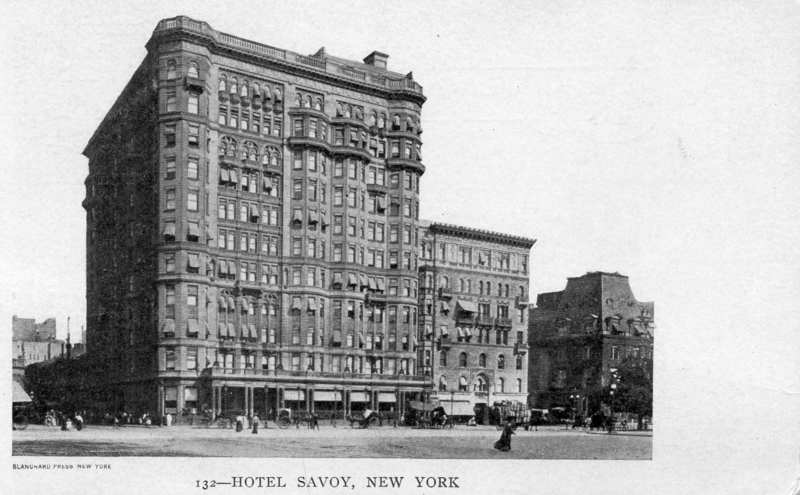 The Hotel Savoy was replaced in 1927 by the Savoy Plaza Hotel, a McKim, Mead, and White beauty razed in 1964 to make way for the 50-story GM Building. To protest the demolition of such a lovely Art Deco structure, about a 100 architecture students and teachers held a “funeral march” at Grand Army Plaza across the street. But the Savoy Plaza bit the dust anyway, and now New Yorkers rush in and out of FAO Schwartz (in the GM Building) and the subterranean Apple Store, not the smoky hotel bars and restaurants of another era.